Here are some of March 2019’s most compelling findings from the U.S. Travel research team. 2018 was a big year for air travel. According to recent Transportation Department data, nearly 900 million passengers boarded U.S. air carriers last year. 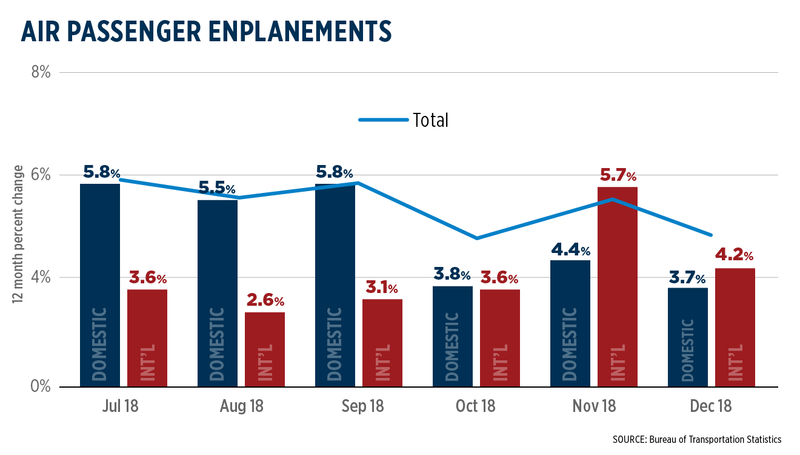 System-wide passenger enplanements increased at a rate of 4.8%, faster than the annual increases registered in 2017 or 2016. Air travel demand also ended the year on a high note: demand increased 3.8% year-over-year as 82.9 million passengers boarded planes across all U.S. airports in December. Domestic flights accounted for 77% of all U.S. passenger enplanements. As demand for air travel increases, it is important that America’s aviation systems are equipped to handle the surge in passengers. U.S. Travel’s infrastructure policy platform makes several recommendations to bolster aviation infrastructure, including an adjustment to the Passenger Facility Charge cap. According to the Conference Board, consumer confidence bounced back significantly in February, logging a reading of 131.4 points. This is 9.7-point increase from a sluggish January, which saw consumer confidence take a hit during the 35-day partial federal government shutdown and as a result of volatile financial markets. While the resurgence is good news, it may not continue at such a vigorous pace. When it’s time to plan a vacation, Americans are in search of more peaceful experiences with family and friends, according to the annual Voice of the Visitor: Outlook on the Attractions Industry report. Compared to five years ago, Americans say they spend more time outdoors and relaxing, and spend less time playing video games and talking to friends online. Accordingly, the top visited attraction types in 2018 were overwhelmingly family friendly: historic landmarks, zoos/animal attractions, theaters, theme parks and history museums rounded out the top five. 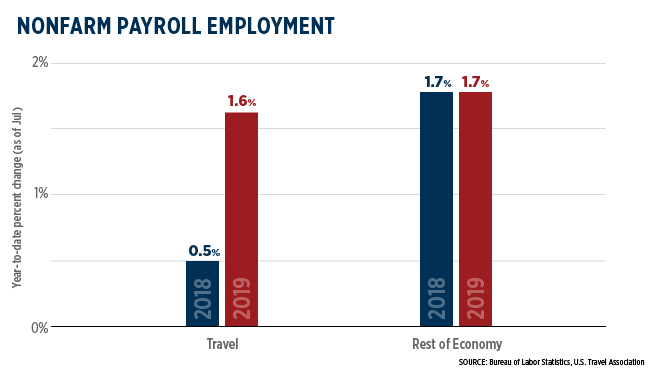 A deeper dive into the data and insights available in the March 2019 U.S. Travel Outlook—which includes the latest data on employment, transportation, inflation, consumer confidence and more—is online here.